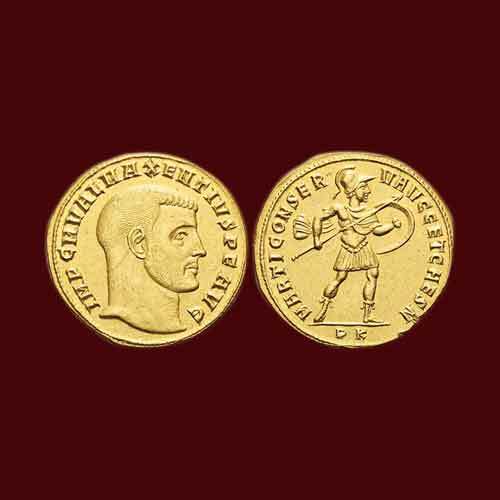 An interesting four aurei gold coin issued under the regime of Roman emperor Maxentius was sold by Hess-Divo Auctions on 29th May for 192,000 Swiss francs. The coin was struck at Carthage in 307 when many rulers were trying to gain control over the Roman Empire. Diocletian resigned from his position as the King on 1st May 305. The two appointed co-rulers also lost their position as Constantine was growing in power early in 306. Maxentius was Maximian’s Son and the son-in-law of emperor Galerius. The gold medallion was probably minted when the new King was appointed as Augustus. The obverse features the king sporting a beard. The reverse features the Roman god of war - Mars, in a military costume and helmet, holding a shield with his left hand and a spear in his right hand. Through the design, Maxentius wanted to convey that he is ready to take on the new responsibilities with the grace of Mars to protect Rome just like the earlier emperors. Maxentius took a stand against Galerius who had tried to make Rome weak and had also led an army to attack the city. Coins for Senior Augustus Maximian and Caesar Constantine were also minted at the same time. Except for a small edge nick on the reverse, the 20.90 grams coin has been graded as Extremely Fine by the firm. It was a part of the Osaka Collection. It was sold earlier by Numismatica Ars Classica in 2002 auction and by Spink auction in 1996.